A virtual version of a traditional network—including CIDRs, subnets, route tables, and gateways—on which your instance runs. (VCNs) and the subnets in them. This topic uses the terms virtual cloud network, VCN, and cloud network interchangeably. The Console uses the term Virtual Cloud Network, whereas for brevity the API uses VCN. A collection of availability domains located in a single geographic location.. A subnet is a subdivision of a VCN. For an overview of VCNs, allowed size, default VCN components, and scenarios for using a VCN, see Overview of Networking. You can privately connect a VCN to another VCN so that the traffic does not traverse the internet. The CIDRs for the two VCNs must not overlap. For more information, see Access to Other VCNs: Peering. For an example of an advanced routing scenario that involves the peering of multiple VCNs, see Advanced Scenario: Transit Routing. Each subnet in a VCN consists of a contiguous range of IP addresses that do not overlap with other subnets in the VCN. Example: 172.16.1.0/24. The first two IP addresses and the last in the subnet's CIDR are reserved by the Networking service. You can't change the size of the subnet after creation, so it's important to think about the size of subnets you need before creating them. Subnets act as a unit of configuration: all instances in a given subnet use the same route table, security lists, and DHCP options. For more information, see Default Components that Come With Your VCN. Subnets can be either public or private (see Public vs. Private Subnets). You choose this during subnet creation, and you can't change it later. You can think of each Compute instance as residing in a subnet. But to be precise, each instance is actually attached to a virtual network interface card (VNIC), which in turn resides in the subnet and enables a network connection for that instance. Originally subnets were designed to cover only one availability domain (AD) in a region. They were all AD-specific, which means the subnet's resources were required to reside in a particular availability domain. Now subnets can be either AD-specific or regional. You choose the type when you create the subnet. Both types of subnets can co-exist in the same VCN. In the following diagram, subnets 1-3 are AD-specific, and subnet 4 is regional. 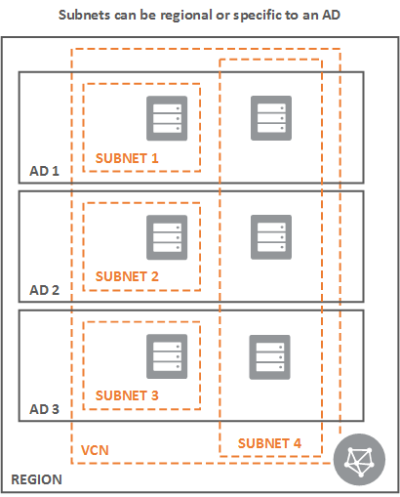 Aside from the removal of the AD constraint, regional subnets behave the same as AD-specific subnets. Oracle recommends using regional subnets because they're more flexible. They make it easier to efficiently divide your VCN into subnets while also designing for availability domain failure. When you create a resource such as a Compute instance, you choose which availability domain the resource will be in. From a virtual networking standpoint, you must also choose which VCN and subnet the instance will be in. You can either choose a regional subnet, or choose an AD-specific subnet that matches the AD you chose for the instance. If anyone in your organization implements a regional subnet, be aware that you may need to update any client code that works with Networking service subnets and private IPs. There are possible breaking API changes. For more information, see the regional subnet release note. One of the first things you do when working with Oracle Cloud Infrastructure resources is create a VCN with one or more subnets. You can easily get started in the Console with a simple VCN and some related resources that enable you to launch and connect to an instance. See Tutorial - Launching Your First Linux Instance or Tutorial - Launching Your First Windows Instance. For the purposes of access control, when you create a VCN or subnet, you must specify the compartment where you want the resource to reside. Consult an administrator in your organization if you're not sure which compartment to use. For more information, see Access Control. You may optionally assign friendly names to the VCN and its subnets. The names don't have to be unique, and you can change them later. Oracle automatically assigns each resource a unique identifier called an Oracle Cloud ID (OCID). For more information, see Resource Identifiers. You can also add a DNS label for the VCN and each subnet, which are required if you want the instances to use the Internet and VCN Resolver feature for DNS in the VCN. For more information, see DNS in Your Virtual Cloud Network. When you create a subnet, you may optionally specify a route table for the subnet to use. If you don't, the subnet uses the cloud network's default route table. You can change which route table the subnet uses at any time. Also, you may optionally specify one or more security lists for the subnet to use (up to five). If you don't specify any, the subnet uses the cloud network's default security list. You can change which security list the subnet uses at any time. Remember that the security list rules are enforced at the instance level, even though the list is associated at the subnet level. Similarly, you may optionally specify a set of DHCP options for the subnet to use. All instances in the subnet will receive the configuration specified in that set of DHCP options. If you don't specify a set, the subnet uses the cloud network's default set of DHCP options. You can change which set of DHCP options the subnet uses at any time. To delete a subnet, it must contain no resources (no instances, load balancers, DB systems, and orphaned mount targets). For more details, see Subnet or VCN Deletion. To delete a VCN, its subnets must contain no resources. Also, the VCN must have no attached gateways. If you're using the Console, there's a "Delete All" process you can use after first ensuring the subnets are empty. See To delete a VCN. For information about the number of VCNs and subnets you can have, see Service Limits. The following procedure creates a VCN without any subnets or gateways for access. You must manually create the subnets and other resources before you can use the VCN. For a quick procedure that creates a VCN that you can try out immediately (that is, with subnets and an internet gateway), see Scenario A: Public Subnet. Choose a compartment you have permission to work in (on the left side of the page). The page updates to display only the resources in that compartment. If you're not sure which compartment to use, contact an administrator. For more information, see Access Control. Name: A friendly name for the VCN. It doesn't have to be unique, and it cannot be changed later in the Console (but you can change it with the API). Avoid entering confidential information. Create in Compartment: Leave as is. Create Virtual Cloud Network Only: Make sure this radio button is selected (the default). CIDR Block: A single, contiguous CIDR block for the VCN. For example: 172.16.0.0/16. You cannot change this value later. See Allowed VCN Size and Address Ranges. For reference, here's a CIDR calculator. Use DNS Hostnames in this VCN: If you want the instances in the VCN to have DNS hostnames (which can be used with the built-in DNS capability in the VCN), select the Use DNS Hostnames in this VCN check box. Then you can specify a DNS label for the VCN, or the Console will generate one for you. The dialog box automatically displays the corresponding DNS Domain Name for the VCN (<VCN DNS label>.oraclevcn.com). For more information, see DNS in Your Virtual Cloud Network. The VCN is then created and displayed on the Virtual Cloud Networks page in the compartment you chose. Next you'll typically want to create one or more subnets in the cloud network. In the Create Subnet dialog box, you specify the resources to associate with the subnet (for example, a route table, and so on). By default, the subnet will be created in the current compartment, and you'll choose the resources from the same compartment. Click the click here link in the dialog box if you want to enable compartment selection for the subnet and each of those resources. Create in Compartment: If you've enabled compartment selection, specify the compartment where you want to put the subnet. Name: A friendly name for the subnet. It doesn't have to be unique, and it cannot be changed later in the Console (but you can change it with the API). Avoid entering confidential information. Regional or AD-specific subnet: Oracle recommends creating only regional subnets, which means that the subnet can contain resources in any of the region's availability domains. If you instead choose Availability Domain-Specific (the only kind of subnet that Oracle originally offered), you must also specify an availability domain. This choice means that any instances or other resources later created in this subnet must also be in that availability domain. CIDR Block: A single, contiguous CIDR block for the subnet (for example, 172.16.0.0/24). Make sure it's within the cloud network's CIDR block and doesn't overlap with any other subnets. You cannot change this value later. See Allowed VCN Size and Address Ranges. For reference, here's a CIDR calculator. Route Table: The route table to associate with the subnet. If you've enabled compartment selection, under Route Table Compartment, you must specify the compartment that contains the route table. Private or public subnet: This controls whether VNICs in the subnet can have public IP addresses. For more information, see Access to the Internet. Use DNS Hostnames in this Subnet:This option is available only if you provided a DNS label for the VCN during creation. If you want this subnet's instances to have DNS hostnames (which can be used with the built-in DNS capability in the VCN), select the check box for Use DNS Hostnames in this Subnet. Then you may specify a DNS label for the subnet, or the Console will generate one for you. The dialog box will automatically display the corresponding DNS Domain Name for the subnet (<subnet DNS label>.<VCN DNS label>.oraclevcn.com). For more information, see DNS in Your Virtual Cloud Network. DHCP Options: The set of DHCP options to associate with the subnet. If you've enabled compartment selection, under DHCP Options Compartment, you must specify the compartment that contains the set of DHCP options. Security Lists: One or more security lists to associate with the subnet. If you've enabled compartment selection, you must specify the compartment that contains the security list. The subnet is then created and displayed on the Subnets page in the compartment you chose. Click the subnet you're interested in. The changes take effect within a few seconds. Prerequisite: The subnet must have no instances, load balancers, DB systems, and orphaned mount targets in it. For more information, see Subnet or VCN Deletion. If the subnet is empty, its state changes to TERMINATING briefly and then TERMINATED. If the subnet is not empty, you get an error indicating that there are still instances or other resources in it that you must delete first. The Console has an easy "Delete all" process that deletes a VCN and its related Networking resources (subnets, route tables, security lists, sets of DHCP options, internet gateway, and so on). If the VCN is attached to a dynamic routing gateway (DRG), the attachment is deleted, but the DRG remains. The "Delete All" process deletes one resource at a time and takes a minute or two. A progress report is displayed to show you what's been deleted so far. Before using the "Delete All" process, make sure there are no instances, load balancers, DB systems, or orphaned mount targets in any of the subnets. For more information, see Subnet or VCN Deletion. If there are still resources in any subnet, or if you don't have permission to delete a particular Networking resource, the "Delete All" process stops and an error message is displayed. Any resources deleted up to that point cannot be restored. You might need to contact your tenancy administrator to help you delete any remaining resources. The resulting dialog box displays a list of the resources to be deleted. The list doesn't include the default components that come with the VCN, but they will be deleted along with the VCN. The process begins. The progress is displayed as each resource is deleted. When the process is complete, click Close. DeleteVcn: Deletes only the VCN and not its related resources. For more information, see Subnet or VCN Deletion. Note that the Console offers a "Delete All" process that makes it easy to delete the VCN and its related resources. See To delete a VCN.